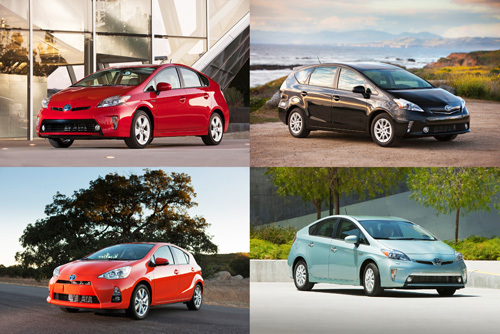 R.L Polk released data late last week confirming the Toyota Prius family of vehicles as the most popular nameplate among California drivers in 2012, based on new car registrations. According to Polk’s count, the Prius Liftback, Prius v, Prius Plug-in, and Prius c total sales equaled 61,893 in 2012, dubbing the Prius as the top vehicle badge in the state, not to mention a clear market leader in the sub-compact segment. Thanks to the state’s growing concern with automotive emissions, many Californians are deciding the hybrid technology that combines both gasoline and electric power is a smart move in the ever changing world we live in. Toyota has sold over half the hybrid models on the road today, thanks to leadership in the field initiated by the visionary, but risky 1997 release of the Prius in Japan, followed by the worldwide debut during 2000. Toyota is also delighted with the editors of Cleanmpg.com dismissing the claims made by Ford that the C-Max can out perform the Prius family in mileage. At the press introduction of the second-generation Prius Liftback in 2004, I took a test drive with an auto journalist who was an efficiency expert from Dallas. By hooking up his laptop, route planning and timing his drive to never stop; he managed to coax 67.7 mpg out of the hybrid in city driving. In short, he drove the car as though playing a video game, something most of us won’t have the time or inclination to attempt. Though spending a little time in the Prius v and Prius c models at similar press events, it has been some time since the opportunity to drive a Prius for more than an hour or so has presented itself. Having always felt the Prius had a niche to fill and a purpose to serve, I’ve always been rather fond of the line and have known owners who are simply delighted with their own personal model. Found one that didn’t like his at all, but that was mostly about it not being big enough to accommodate his rather sizable frame. Nevertheless, the discussion regarding the relative merit of the Prius line-up versus the C-Max is likely to continue. Frankly, we think the competition will do both the brands a bit of good.